Plockton Harbour Community Interest Company provides and maintains 15 moorings for visiting yachts and access to two pontoons so that crews can visit the beautiful village of Plockton. The moorings are set in two trots of 5 and 4 at the entrance to the bay – at the north east, and two trots of three towards the south side. These south-side moorings are generally used by visiting yachts wishing to stay for longer periods. All moorings are professionally dived and checked annually. They are marked with yellow cans (with a V) and a red pickup. Visiting crews have access to both pontoons. 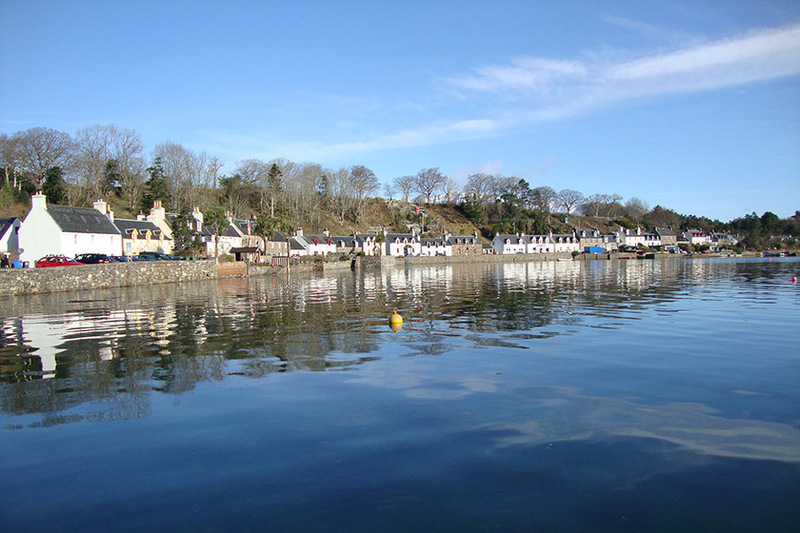 The pontoon at the eastern end of the village is accessible at all times and provides access to the village shop and restaurant with a slightly longer walk to the Plockton Hotel and Plockton Inn. The pontoon at the western end of the bay is tidal but provides (normally) a more sheltered berth. Mooring fees are £15 per day with a discounted rate for 7 days at £75. Visitor mooring fees include use of the pontoons for shore access by dinghy or brief visits alongside for crew change/yacht replenishment etc., for other visiting vessels (e.g. anchored in the bay) there is a daily pontoon charge of £5. Fees should be paid using the easy ‘envelope’ system explained on the pontoon notice board, or by Bank Transfer to Plockton Harbour CIC, sort code 80-22-60, account no. 18349968, referencing your boat’s name. Visitors who have been to Plockton before will know the attractiveness and unspoilt beauty of the village which is the Jewel of the Highlands. There is wonderful scenery round the island of Skye, Raasay, Rona and the area is often considered to be the best sailing around the West Coast of Scotland. Plockton makes an ideal place to be the centre of your cruise like many other sailors who return year after year to enjoy the music evenings in the Inn and Hotel, the countryside, the walks, the beautiful views on the Kyle to Inverness railway line and the unspoilt tranquillity.